For a limited time, Appointment Book Network (MLT) Version, will be offered for a special of only $257 for a limited time for this version! Click here to order now! Versatile appointments system for networked professional / business offices and service centers. Provides up to 20 columns on the appointment page with user-adjustable column widths. 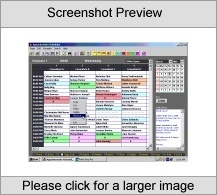 The MLT version accepts multi-line text entries in the appointment time slots. This allows easy entering and viewing of client appointment details: e.g. multiple clients can be appointed in the same time slots, client as well as service details can be entered together. Suits medical, paramedical and dental practices, legal and accounting firms, tax agencies, financial advisors, automotive and tire service centers, sales and admin offices, fashion models and photography studios, college enrolment offices, employment agencies, plumbing, electrical and heating services, etc. Try the free trial version first, or click here for pricing/to purchase a full version! Order by phone, fax, cheque, money order, or order securely online!